The latest installment of the Avengers series is headed to theaters soon and you can win free tickets all month long at one of our Raleigh area PDQ restaurants. 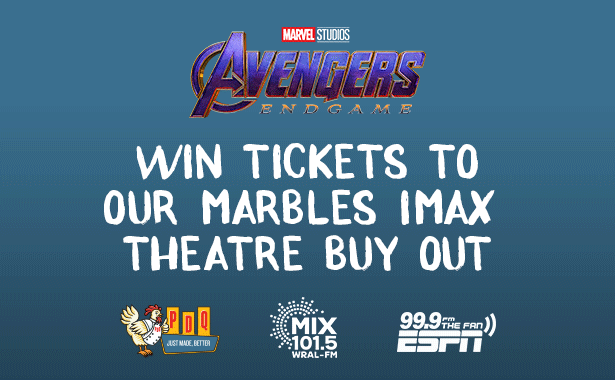 We have joined forces with our friends at Mix 101.5 and 99.9 The Fan to give away tickets for the premier of Avengers: Endgame! on Friday, May 3 at the Marbles IMAX theater. There will be four ticket stops for the chance to win a pair of tickets to the movie. At each ticket stop, they will be drawing winners every FIVE minutes! Stop by your local PDQ on the dates below for your chance to win free tickets.